RPCLIF - Roleplay Community Life is Feudal - Home - Enjin - Set sail to Venaris! The Kingdom of Arendor is not what it once was. Centuries without a strong centralized government has created chaos amongst the nobility. Ambitious lords and ladies compete and undermine one another for wealth and power. The situation only worsened after the gods became silent. In the 45 years since then, the Church of the Nine lost nearly all of its power. As the last source of stability withered, Arendor faced some of the most turbulent times in its history. A few weeks after, trade ships from Venaris arrived at several major ports with their coffers filled to the brim with gold and gems. The Venari merchants traded their wealth and filled their ships with resources until they could carry no more. As a result, rumors spread and soon the Venari fleet gained a moniker as “The Golden Fleet”. 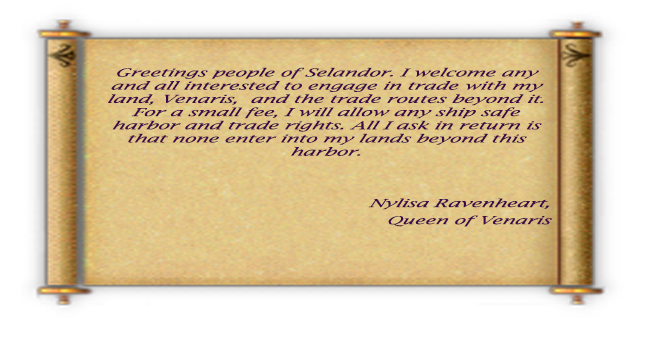 Quickly, Venaris itself became a center for trade and one of the most important ports on the wealthiest trade route in Selandor. Despite the high traffic, little was known about Venaris beyond it’s Port town. Countless spies were sent find out more about the island, but few ever returned, and those that did came back with no results. However, a few months ago a spy serving Duke Darien Ashwarden discovered a gold and diamond mine hidden in the island. Seizing the opportunity, the Duke sent a small colony to settle on the island. However, the colony was immediately destroyed by the Queen’s men. 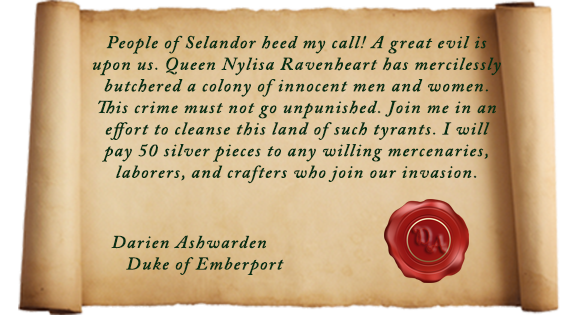 The message from the Queen was clear “Do not test me.” However, rather than heed the warning, Duke Ashwarden readied himself for war and sent a message to every major city in the known world.